Driffield Striders are committed to protecting and respecting your privacy. 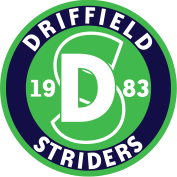 For any personal data you provide for the purposes of your membership, Driffield Striders is the Data Controller and is responsible for storing and otherwise processing that data in a fair, lawful, secure and transparent way. You may give us information about you by filling in forms at an event or online, or by corresponding with us by phone, e-mail or otherwise. This includes information you provide when you register with the Club, The information you give us may include your name, date of birth, address, e-mail address, phone number, name of the EA affiliated Clubs with which you are registered and gender (Athletics Data). The club has the following social media pages: Facebook. All members are free to join these pages. If you join one of the Social Media pages, please note that provider of the social media platform(s) have their own privacy policies and that the club do not accept any responsibility or liability for these policies. Please check these policies before you submit any personal data on the club social media pages.